Instead, hundreds of firefighters offered polite applause or silence to GOP White House prospects Tuesday at a union-backed presidential forum, a Washington event that highlighted organized labor's evolving role in national politics. "Both parties want to work with firefighters," said former Florida Gov. Jeb Bush, a likely Republican presidential candidate who addressed the crowded hotel ballroom in a brief video message. "People on both sides of the aisle understand the tremendous commitment our courageous firefighters make each day." 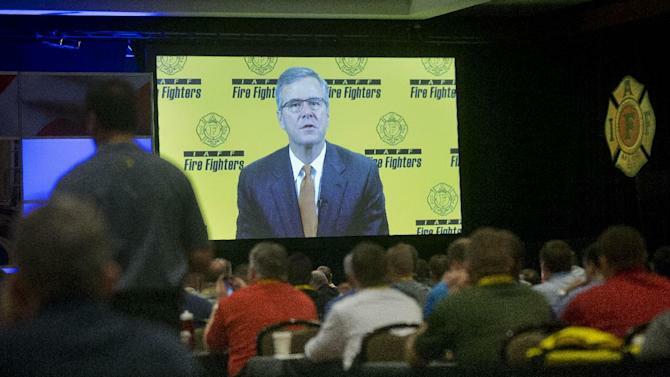 Bush was among a half dozen potential Republican White House candidates to address Tuesday's gathering of the International Association of Fire Fighters, an organization that has poured millions of dollars into recent elections — largely to benefit Democrats. 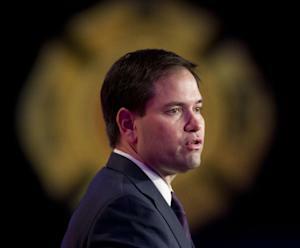 Union leaders could not remember endorsing a Republican presidential candidate. Organized labor generally has worked aggressively against some of the GOP's more controversial leaders such as Wisconsin Gov. Scott Walker, who signed legislation to weaken union members in his state on Monday and did not appear at the firefighters' conference. Yet, beyond the cool reception for many Republicans at Tuesday's event, there are signs the GOP is cutting into the Democratic Party's long hold on labor unions. Exit polls taken after last fall's mid-term elections found that union members were almost evenly split between the Republican and the Democrat in the major statewide races for U.S. Senate. The Republican wave in the November elections left many unions nationwide looking exceptionally vulnerable. Union leaders on Tuesday conceded that a significant portion of their members — most of them white working-class men — vote Republican. "We're a union that understands the diversity of our membership," said Harold Schaitberger, president of the International Association of Fire Fighters, noting that his organization would contemplate presidential endorsements in both parties over the coming year. Jim Tolley, president of the Florida Professional Firefighters union, said his organization endorsed both of Bush's successful gubernatorial campaigns. He described Bush as "very understanding" and said his Florida members might endorse him again should he run for president. "Will this entire body? I think there's going to be a lot of discussion," he said. Would-be Republican presidential candidates did their best to make a good impression. "We're sensitive to the issues you care about," said Florida Sen. Marco Rubio, who is telling donors he will seek the presidency. "You're an important part of the ability of our governments to respond. And we'll continue to be allies and advocates for the causes that are important to your profession." "God bless firefighters, each and every one of you," said Texas Sen. Ted Cruz, whose calls to repeal President Barack Obama's health care law were met with silence. "You are frontline fighters in the war against terrorism," said Rep. Peter King, R-N.Y., who cast some of his Republican colleagues, like Cruz, as hypocrites for voting against a recent bill to fund the Department of Homeland Security. Democrats were well represented on Tuesday as well. While former Secretary of State Hillary Rodham Clinton did not attend, the speaking program featured several possible Democratic hopefuls, including Vermont Sen. Bernie Sanders, former Virginia Sen. Jim Webb and former Maryland Gov. Martin O'Malley. "There are two important things you did not hear from any of today's Republican speaker. 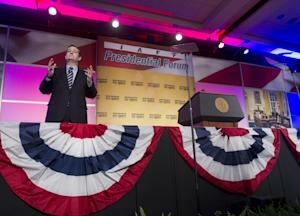 One is a commitment to collective bargaining," O'Malley declared, and was immediately interrupted by a standing ovation. "The second is a commitment to funding public safety." Webb noted that the firefighters union previously supported his Virginia Senate campaign. "I may call on you again, so stay tuned," he said.